Who’s leading the way in VCaaS? Video Conferencing as a Service, or VCaaS, has absolutely exploded over the last few years. Adoption has been rapid and enterprises are leading the way in rolling out video-first meetings, higher levels of productivity and reducing the cost of travelling between meetings. The benefits and uses cases for VCaaS are plentiful. If you’re reading this, you likely know and approve of VCaaS. Rather than run through them, let’s run through ten of the top VCaaS providers leading the way in 2019. In no particular order, here are some of the VCaaS providers to consider. Zoom is making a lot of noise, not just the in VCaaS space, but in the entire comms industry and on the stock exchanges. Valued at a whopping $1bn, Zoom is the first unicorn of the video conferencing space. Experts from outside the industry are suggesting Zoom is a great buy for prospective investors and it’s easy to see why – aside from being a rare profitable unicorn. Zoom has taken on the big boys with its as-a-Service approach and it has paid dividends. Best features highlighted by users often include calendar sync across desktop and mobile, as well as streamlined native calendar functionality. Internal and external communications, all-hands meetings, and training through can all be delivered via one communications platform – rather than having several video and conferencing applications for different parties or personas. The co-annotation feature is a favourite, taking screen sharing to the next level. At Zoomtopia, the brand’s annual get together, Zoom unveiled that they would dive into the cloud phone system market too, and they did. Zoom Phone is available across the NAM region and is set to be deployed across further regions through the rest of the year. Zoomtopia also previewed new features coming to Zoom like virtual backgrounds, 1080p video and audio signature. Zoom’s most recent partnership is that with Theta Lake. Theta Lake for Zoom provides archiving integrations and compliance solutions for chat, video and audio content. Using artificial intelligence, you can detect compliance and security risks across any content shared in Zoom. Poly, the recent biproduct of the Polycom and Plantronics rebrand, has been pioneering the video conferencing space for many a year. Both Polycom and Plantronics have been shaping the landscape of equipment in the VCaaS industry for some time. Polycom has taken the traditional “star” conference unit from an audio only dial in device to a full content sharing and video conferencing portfolio. Poly enables enterprise-grade video collaboration solutions that are designed to equip different meeting spaces from huddle rooms to large boardrooms. Polycom Studio allows a user or team to be armed with their own USB device so any PC or Mac user can utilise Polycom Studio to enhance audio and video meeting experiences. Users of video conferencing applications like Zoom, Microsoft Teams, Microsoft Skype for Business, Google Meet, Cisco Webex and Amazon Chime will be able to experience HD audio and video quality via various Poly devices as they continue to push the interoperability agenda. Plantronics is traditionally famous for its portable audio units like headsets. However, more recent additions to the portfolio including the Habitat Soundscaping solutions, improving the collaboration experience by introducing natural sounds into the workplace. We also see a wide range of personal conferencing units so conferencing can continue when on the move. As much as video conferencing is favoured in both the enterprise and small businesses today, Poly is well aware that sometimes the environment requires the next best thing to a full blown video conference. BlueJeans is a zero download VCaaS option available in Meetings, Rooms and Events flavours. By scheduling and starting meetings at the click of a button, BlueJeans is a favoured option for businesses with varying users across different companies and departments. Their meeting solutions simply work via a browser. Outside of a browser, BlueJeans works seamlessly with Microsoft Teams, Workplace by Facebook, Office 365, Google Calendar, Slack, Splunk and Trello, to name a few. App switching is currently a hot topic being addressed by IT Managers and productivity protesters. By utilising the BlueJeans API, you can add cloud-powered video calls to your own applications. Once in a video meeting, BlueJeans is powered by Dolby Voice and contains all the features businesses have come to expect from a VCaaS solution. Meeting recording, content sharing and even live video meetings can be triggered instantly from the collaboration and calendaring tools you use every day. Additional features include handy tools like polling, Q&A and text chat. Integrations with key artificial intelligence and voice recognition partners help streamline tasks like intelligent transcription and meeting initiation. BlueJeans is compatible with Dolby, Cisco, Polycom, Lifesize, and other H.323 or SIP-based room systems. A free 30-day trial is available for new users of BlueJeans looking to take it for a test drive. PGi’s flagship VCaaS product is GlobalMeet. Key features of the meeting solution include the GlobalMeet Widget which addresses multi-tasking issue during meetings. You can even access functionality with the meeting screen minimised as you switch between other apps. Live transcripts and summaries are available during and after a meeting. Users can follow a meeting in areas when they need to be in attendance but perhaps have a sensitive or loud environment surrounding them. Active directory integrations are available with Office 365, so the meeting solution is tied in with your Outlook and Office contacts. In enterprises, where staff and departments are distributed across multiple sites, knowing who your meeting helps a great deal. The video-first collaboration platform has now been transformed into a fully-fledged Unified Comms as-a-Service (UCaaS) solution. Replacing the legacy phone system has rapidly become more than just rip and replace. Businesses now understand the available features that moving from on-premises PBXs to cloud collaboration platforms can bring – as well as the short term and long-term benefits that a business will gain. PGi also introduced GlobalMeet Webinar and GlobalMeet Webcast last year. By either hosting a webinar to engage an audience or broadcast a message to the rest of your organisation, PGi has expanded their VCaaS offering into more than just the traditional meetings. West’s conferencing background stems from their Intercall roots. Long established as leaders in the audio conferencing sector, West now provides a virtual face-to-face experience with any audience from anywhere at any time on any device. West’s VCaaS portfolio is split into three options. They have strong partnerships with both BlueJeans and Cisco Webex and have previously won high accolades accentuating their partner status with both vendors. InterCall Unified Meeting 5 is West’s own take on video conferencing. Here, you can benefit from the usual suspects of the video meeting world like screen sharing and file uploads. The familiar HD audio conferencing from Reservationless-Plus ties in with HD video services to take existing conference users to the next level where you can join online meetings with one click from the Unified Meeting 5 desktop app. Most impressively, West suggests that even if your network connection is unreliable, your video streaming will be continuous and distortion-free. This is wonderful news for users connecting in remote areas or on the move. They discussed their approach to collaboration with Patrick Waston at Enterprise Connect 2019. StarLeaf provides a wealth of video conferencing and meeting solutions covering boardrooms, small meeting spaces, desktop video calling, and solutions tailored for remote working. These are all catered for via a device-agnostic approach, opening the door for complete video interoperability. StarLeaf is interoperable with Skype for Business and any standards-based systems including Zoom, Cisco, Lifesize and Polycom. The StarLeaf Cloud enables instant deployment so there is minimal delay in getting started with the StarLeaf app. Within StarLeaf, you can run interactive and engaging sessions with support for bi-directional screen sharing, multiple screens and cameras, and up to 50 remote attendees. Meetings can be recorded- including all content like video, chat and audio – for after the event information to be reviewed and stored. StarLeaf APIs move the StarLeaf meeting and video experience into apps like Slack and BlueJeans to remove the need for constant app switching. StarLeaf also transforms the standard desk phone into a device that can instantly join video conferences. The PT Mini 3020 handset transforms individual desktops for high quality, fully-featured video calling. A compact device complete with handset, touchscreen, USB camera, and the ability to connect to a PC for screen sharing. Users of a PT Mini 3020 can benefit from full StarLeaf meeting and video functionality through the everyday phone. Cisco are long term leaders in the video space since their acquisition of Webex. The brand Cisco Webex was formed and has long dominated the video meeting space. As Cisco Spark, the messaging and collaboration client, became Cisco Webex Teams last year, Webex has transformed from a meeting experience to a true collaboration client. Webex’s VCaaS options come as either Cisco Webex Meetings as a standalone product or embedded within the collaboration client. Features such as content sharing, meeting recording etc all come as standard. Microsoft established its VCaaS play with Skype for Business Online. Full of features and functionality, the Lync replacement became a quick business favourite adopting the familiar Skype look and feel. With functionality like screen sharing, video and calendaring as standard, additional bolt ons like meeting recording and whiteboards made Skype for Business the go-to video product for enterprises. As the collaboration market has matured into team messaging rather than simply chat, Microsoft Teams has replaced Skype for Business as the VCaaS product of choice in the Microsoft portfolio. Teams enhances the meeting experience by introducing meetings in channels and utilising file storage enhancements and integrations. GoToMeeting was a long-time preferred tool for business to get together before the video conferencing boom. Traditionally, businesses would connect with client via the audio meeting tool. 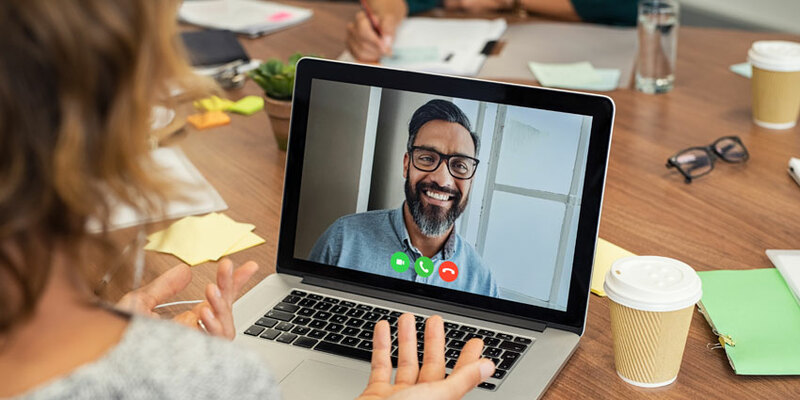 Through their dominance before video conferencing, GoToMeeting can boast 18 million worldwide users per month, 80 million online meetings per year and suggests that businesses close deals 20% faster using their meeting technology. As those legacy users start to adopt the new technology available within the GoTo and LogMeIn portfolio, you can expect all of these stats to sky rocket. Another platform available anywhere and on any device, GoToMeeting makes it easy to connect with people any way you want – and with even more tools than its original platform. These include full video and team messaging capabilities, automated transcripts to minimise note-taking, options to meet now or intelligently schedule and customisable settings on a team or department basis. You can try out GoToMeeting with a free 14-day trial. Google Hangouts Meet is Google’s flagship VCaaS product. Whilst there has been uncertainty surrounding how much development will continue into the Hangouts portfolio, existing users are more than happy with the functionality they benefit from. Meet is fully integrated with G Suite, so you can join meetings directly from a Google Calendar event or email invite. Event details are carried forward, whether you’re joining from a laptop, phone or the conference room. G Suite’s enterprise edition also creates a dial-in phone number for each meeting so users without access to WiFi can join with ease. It’s often easy to forget that mobility is a key consideration when it comes to video conferencing. Teams using Skype for Business or meeting systems based on SIP and H.323 standards like Polycom and Cisco can seamlessly join a Hangouts Meet meeting via the Pexip Infinity Platform. Hangouts Meet hardware connects any meeting room or huddle space to a video meeting with a single click. More information on all of the VCaaS options is available on the vendors respective websites. There is loads of content across each of the brands highlighted in this post across UC Today. For any specific queries, views or help with a product, please reach out in the comments or on social media.